Professionally designed, we have outfitted our condo with everything you need to have a care-free vacation. Charming Sand Pointe 214 is truly a vacation paradise. Lounge in the living room as you enjoy a full spectrum of entertainment with a flat screen television, cable TV, DVD player, stereo and CD player. We hope the Sanibel Blue Lagoon will be a place you enjoy, remember and look forward to visiting again. You will find everything you need in the beautiful kitchen, whether you're looking to create a gourmet meal or a picnic lunch. There are plenty of other amenities in the condo including a full size washer and dryer, iron and ironing board, and a hair dryer. While we think you will love relaxing in the condo, we know you didn't come here to spend your vacation indoors. Right past the lagoon is the heated swimming pool with plenty of chairs and tables. There is also an outdoor shower to rinse the sand off and a bathroom. Just past the pool is the boardwalk that takes you to the quiet beach and warm waters of the Gulf of Mexico. Stop at our storage unit and pick up a couple beach chairs and an umbrella. There is also a small selection of beach toys. Don't forget to grab your beach towels from the condo before heading down to the water! 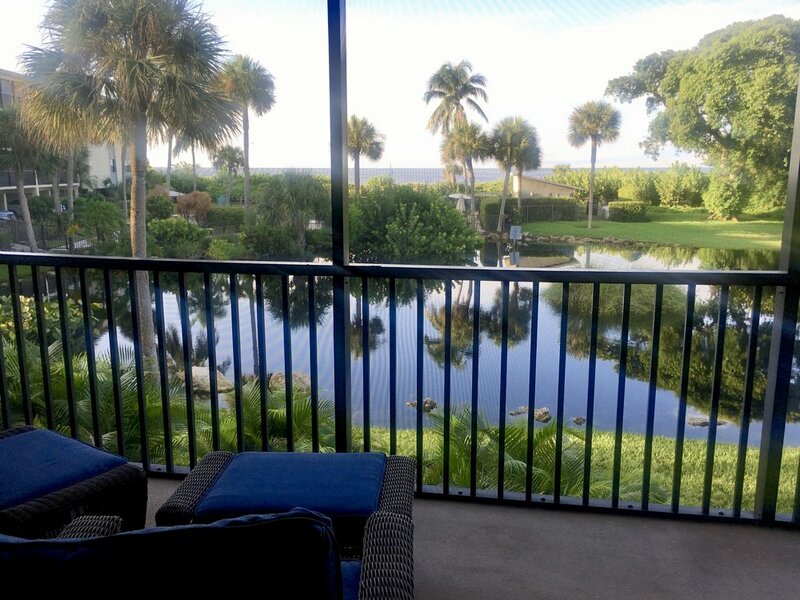 The extra large lanai is the perfect spot to relax and take in the gorgeous views, with separate lounging and dining areas. The comfortable master suite is furnished with a king-size bed and looks out over the lagoon and Gulf. The master bathroom has double vanities, tray ceiling and a walk-in shower. The second bathroom has a combination shower / bathtub. STORAGE UNIT WITH BEACH EQUIPMENT. beach towels are in the condo. Condo Size – 1200 sq. ft.